A group of Griffin High School biology students visited the University of Georgia Griffin Campus last week to conduct a science experiment under the direction of college students. The UGA students were fulfilling their service learning component of their “Basic Skills in the Laboratory” class, taught by Margie Paz, a senior lecturer in the microbiology department of the UGA Franklin College of Arts and Sciences. “Participating in this service-learning activity helped the college students meet the requirement of UGA’s new experiential learning initiative, which began this semester. Every UGA undergraduate student must now participate in a hands-on, learning opportunity outside of the classroom. The GHS students who participated in the experiment are all currently enrolled in biology classes and were selected for the experience by their teachers. 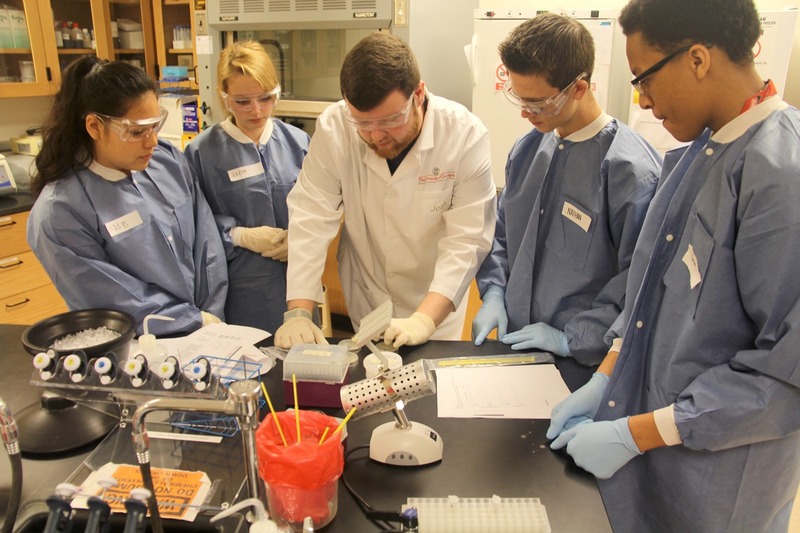 The high school students performed a genetic engineering experiment using green fluorescent protein (GFP) under the supervision of the UGA Griffin students. The experiment helped the GHS students understand the scientific process involved in the GFP gene’s expression, Paz said. Kezhan Khazaw, the GHS teacher who accompanied the group, said the visit also exposed the high school students to equipment they don’t have access to at the local school. “By coming to the college campus, our students were able to practice the lab techniques they have been learning, like wearing the proper personal protective equipment, putting on safety goggles and following proper procedures,” she said. While leading the high school students through the experiment, the college students talked with their younger counterparts about the experiment and topics ranging from sports to the college experience. “This is my favorite lab,” said Hunter Donahue, a biological science major, speaking to students at her lab table. “Toward the end of this, you’ll see the colonies glow,” said Katy Dawsey, also a UGA biological science major. At another lab table, UGA microbiology major J’Lynn Lewis and environmental resource science major Yancey Barton fielded questions about the costs of college. “This is pretty exciting. I’ve driven by (UGA Griffin) lots of times with my parents, but I’ve never actually been on campus until today,” said Gladys Partida, 14. “I’ve never done anything like this before. We’re doing the things we already knew about, but we’re doing it hands-on, and Josh really broke it down where it was easy to understand,” said Leslie Caraway, 14, of her student leader Joshua Hamilton, a microbiology major, while streaking nonpathogenic E. coli, transformed with the GFP gene, on a petri dish. Service-learning is the application of academic skills and knowledge to address a community need, issue or problem and to enhance student learning. By participating in service-learning activities, the UGA Griffin Campus students integrate two core aspects of UGA’s mission — teaching and service.